Who can tame the tiger (Kim Jong Kook)? Who dare to mess with this guy who even Kim Jong Kook was afraid of? He gave a scary image and his movement is very swift for his age. Do you remember him in Running Man episodes 54 and 69? He planned his movement and terrorizes people with a sudden attack! The tiger have to declaw himself in front of the hunter. Profile: Japanese mixed martial artist and judoka. He is a fourth-generation Japanese of Korean descent and acquired Japanese nationality in 2001. He won gold at the 2001 Asian Championships and 2002 Asian Games for South Korea and Japan respectively. As a mixed martial artist he became the 2006 K-1 HERO'S Light Heavyweight tournament champion. He is currently with the US promotion Ultimate Fighting Championship(UFC). He is known for his high level Judo, technical and brawler-like striking, and is considered to have one of the toughest chins in MMA. Kim Jong Kook skills: Boxing, Taekwondo, Kickboxing, and Ssireum (Korean Wrestling). Kim Jong Kook persona at Running Man is very strong, but have you ever wondered, is there a moment when someone overpowered him by strength? We can find this person who is always a rival to Kim Jong Kook. His name is Chu Sung-Hoon and he appeared in Family outing in episodes 50 and 51. The tiger lost to a lion during wrestling (in the ring) and arm wrestling. That is not all, he returned to 'hunt' kim Jong Kook in episodes 131 and 150 of Running Man. Chu Sung-Woo competed with Kim Jong Kook in nametag tearing and Korean wrestling! That was really one of the most exciting episodes by far since we all know that they will try their best to defeat each other. Ultimately, Spartakook lose to Chu Sung-Hoon after a tough fight but kudos to Jong Kook since his day job is after all a singer and not a fighter. I am sure most of the people agree with me that Kim Jong is known to have weaknesses for women in general, especially young and pretty ones. But this lady actually pulled Kim Jong kook hair, poked and pinched him during games! Basically, it went against Spartakook principles to use strength on ladies just for the glory of winning a game. That was indeed sweet and endearing of him but we can't denied that ladies make use of that to their advantages. That results in him losing some of the games. Shin Bong Sun is a comedian and she is a big Fan of Kim Jong Kook. In front of this woman, Kim Jong Kook appears to be helpless. 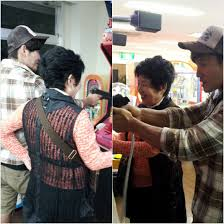 Unlike most of the female guests who took advantage of Kim Jong Kook gentleness to win games, Shin Bong Sun often choose to be in the same group as him and even 'sacrifice' herself to help him. There is only one word to describe Kim Jong Kook reaction to her - helpless! Kang Ho Dong used to co host with Yoo Jae Suk in popular variety program: X-Man. During Strong Heart, Kim Jong Kook revealed that he kneeled down infront of Kang Ho Dong after the latter refused to answer his phone call because he joined Yoo Jae Suk in Family Outing. He knee down during Kang Ho Dong wedding. Although it is not a sign of weakness, more like asking for forgiveness. Kim Jong Kook mentioned that he did go down on his knees to resolve the misunderstanding. Although, they are still friends, i think there will still be some awkwardness between them. Both of them were trained in Korean Wrestling. In terms of strength and tactic, they were on par. In Fact during X-Man days, these two men can compete with each other. Lee Kyung Kyu guest starred in episode 143 of Running Man. Remember how he uses his seniority to overpower Jong Kook? . Unlike Running Man weak hyung Yoo Jae Suk and Ji Suk Jin, Lee Kyung Kyu uses his seniority during games to get his way. He used that to create more laughter in the variety show. 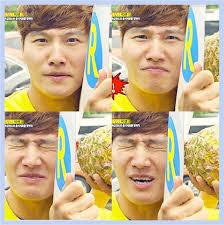 Remember in episode 144 of Running Man, Kim Jong kook has to endure a pineapple pricking his ear. The Running Man team were so brilliant in coming out with creative games. Imagine someone placed something unknown near your ear!! That was the expression of fear and helplessness. Who can resist the charm of Ahjuma? They were asked in episode 43 of Running Man, who do they want to partner with? Most of them replied, "Kim Jong Kook, because he look like Taceyeon in his 30s!" Jong Kook looked shocked at the attention and tried his best to dodge the ahjuma from catching him. DramaQueen: Why Running Man drops in Rating?